Launched in 2007, 4 Ingredients has grown to become the biggest selling self-published title in Australian history, with a simple concept: easy recipes with just 4 ingredients to help save time and money in the kitchen. 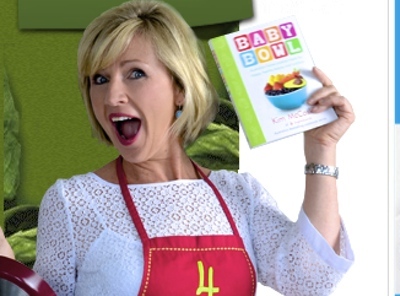 The brand, co-created by Sunshine Coast mum Kim McCosker, has released several books (selling more than 4.3 million copies worldwide), launched in the UK, Ireland and the US, released a brand of cookware, and developed an iPhone app with over 35,000 downloads. The 4 Ingredients online store was launched alongside the brand in 2007, selling the cookbooks along with a range of cookware and other accessories. The cookbooks were also sold in off-line retailers and bookstores such as Big W and Dymocks. With the 2011 collapse of REDGroup, the company behind Borders and Angus & Robertson, 4 Ingredients lost 200 retail stores and 30 percent of its distribution network. It became clear the brand needed to become less reliant on external distribution networks and take the matter into its own hands by building an online store as a strong distribution channel in its own right. build the online shop into an easy-to-use platform that 4 Ingredients could control in-house. After a thorough study PiperDM identified that while the original 4 Ingredients website was receiving a healthy amount of traffic, not enough of these visitors were converted into buyers. PiperDM’s aim was to learn about the buyer persona of 4 Ingredients’ target market to ensure an understanding of their buying behaviour. a large percentage of browsers abandoned items in the shopping cart. PiperDM identified what they call FUDDs: the fears, uncertainties, doubts and deal-breakers that put customers off completing the transaction, and took steps to eliminate them. Following the website audit, PiperDM’s mission was to rebuild a site optimised for the highest conversion rate and to find a way to monetise the whole site, rather than just the shop. PiperDM revamped the online shop through a process of small changes, including what is known in the industry as the ‘300 million dollar button’: the simple act of replacing the ‘register’ button with a ‘continue’ button, as having to register to buy products was stopping customers completing their purchases on a large ecommerce website. The designer who coined the phrase ‘$300 million dollar button’ did further investigation into customer behaviour and found out first time purchasers had no interest in being ‘in a relationship’. They resented having to register for the large ecommerce website and suspected nefarious intentions. Repeat customers also found it frustrating as they forgot their details. Forty-five percent of them had multiple registrations and on some days 160,000 people requested their passwords. Seventy-five percent of these didn’t return to complete the purchase after the password was emailed to them. In PiperDM’s experience, site owners generally have no idea when there is a problem with small details and the agency has seen it cost them thousands, if not millions, of dollars. 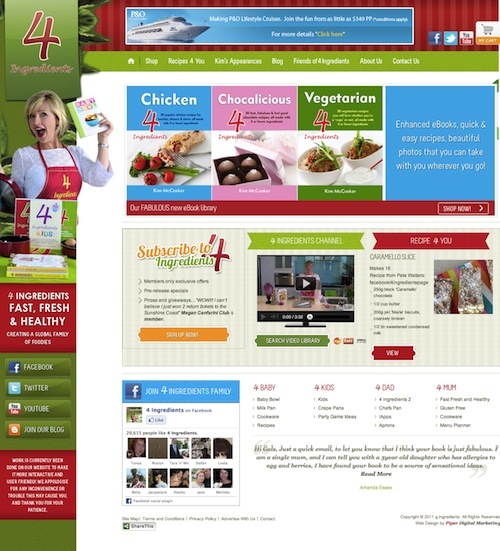 So shopper psychology was top of mind for PiperDM when designing the new 4 Ingredients website. PiperDM decided to focus on what makes people decide to buy and, once that decision has been made, what can stop them completing the transaction. The first step was to remove the ‘$300 million dollar’ register button, and give visitors the option to check out as a guest, saving them from having to fill in several forms before purchasing. Then, the entire navigation process was simplified. PiperDM also reminded 4 Ingredients that even online, the company should still behave like a shop, with a sales assistant at the ready. The digital marketing agency consequently inserted a visible customer service button to direct all customer queries easily. Just like any other merchandiser, 4 Ingredients needed to consider its website as a shop window that needs to be fitted out accordingly. Sale items and special offers should be advertised accordingly. With this in mind, a 4 Ingredients ‘top sellers’ list was implemented, listing the best selling items of the website as an incentive for other browsers. The company also added a customer review section enabling customers to share their experience. To further increase the monetisation of the website, PiperDM also worked on up-sell elements to promote other products for a cross sell opportunity on the product detail page, using a ‘you may also like’ feature. In order to ensure customers completed their purchases, PiperDM placed clear shipping information on the product page, so there were no nasty surprises, and offered free shipping in Australia. The site was monetised further through advertising space and, to make this valuable to an affiliate partner, the company needed to increase the amount of time someone spent on the site, which was done by engaging visitors further by getting them to interact with the site. An easy to use recipe directory and a members club with members-only pages were created. The marketing company also built a database to encourage people to become club members and sign up to weekly bargains. Prominent advertising space was also put into place, including access to pages featuring company affiliates. 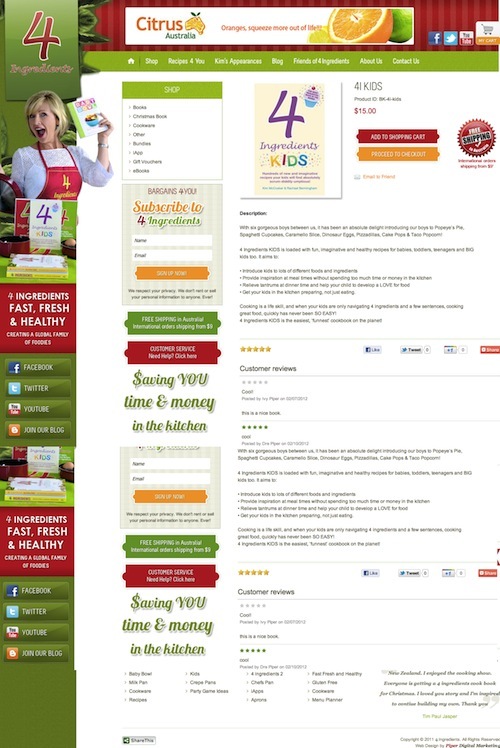 Finally, the Facebook and blogging community with which the 4 Ingredients brand was already engaged needed to be leveraged, so PiperDM added social media sharing icons to the website to drive more sales by recommendation, and drove visitors to 4 Ingredients’ very active Facebook page with an extended Facebook widget on the home page. The new website went live in November 2011. The website overhaul resulted in a five-fold increase in Christmas sales during a period in which overall Australian retail turnover fell 0.1%. With data from the first two months (December 2011 and January 2012), PiperDM was able to benchmark the new site’s performance with the old site’s performance in the same months. Despite less traffic to the new website, the actual dollar-value of sales had a 466% increase in December 2011 (compared to December 2010) with the number of items sold increasing to 22,000 up from 4,700 during the previous period. The increases continued in January 2012 with a 219% increase compared to January 2011. Overall, the average spend per order increased by 137%, the pages viewed by visitors nearly doubled, with 174% more time spent on site, and the number of orders per unique visitors quadrupled. In the toughest retail environment in decades and as more retail moves away from the high street to online, retailers have to get more savvy about the small things that make customers walk away from a purchase. Planning a website makes a big difference – a site can be beautiful to look at but its the small design details that lead to exponential changes in sales.